Jersey Shore is a reality television that follows eight housemates spending their summer at the Jersey Shore. In the show, the eight stars consistently use tanning beds to darken their skin. The Skin Cancer Foundation would like to see the Federal Trade Commission look into this claim while MTV puts warning labels on all reruns and online episodes. They would also like to see warning labels on all products, advertisements and games tied to the television show, warning of the dangers of tanning. Dr. Joel Schlessinger is very passionate about this issue and supports The Skin Cancer Foundation’s efforts. “Shows like this end up encouraging young people, including children, to take up a habit that has been shown to cause cancer,” said Dr. Joel Schlessinger. Dr. Joel Schlessinger hopes to see a change in the portrayal of tanning beds on television. Dr. Joel Schlessinger has high hopes for this complaint as he sees this as a serious issue in our society today. Dr. Joel Schlessinger is passionate about stopping the spread of skin cancer, especially in adolescents. Learn more about Dr. Joel Schlessinger’s involvement in the fight for skin cancer. Do you think Jersey Shore leads to more tanning bed use? Tell us your opinions in the comments. Click here to read the article “‘Jersey Shore’ still promotes tanning, group says,” featured in USAToday. Joel Schlessinger MD shares his thoughts on airplane safety and asking for doctor help on -board so you can be prepared. Joel Schlessinger MD shares his thoughts on airplane safety and asking for doctor help on board so you can be prepared. When we usually think of airplane safety, we think of buckled seatbelts, floatation devices and oxygen masks. But what happens when there’s a medical emergency when you’re 32,000 feet in the air? If you’ve ever been on an airplane when the flight attendant asks if there is a physician on board, you know how terrifying it can be. 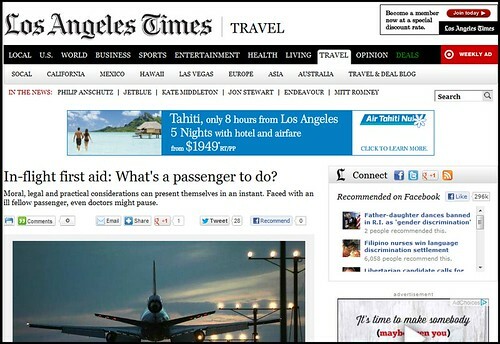 Joel Schlessinger MD was recently featured in an LA Times article, In-flight first aid: What’s a passenger to do?, where here shared his thoughts on the topic as a frequent-traveling physician who has aided in medical airplane safety. You can help struggling passengers. Here’s how. “If a passenger notices another struggling person on an aircraft, it is very important to remain calm and summon for help. It may be difficult, but it is the best way to get the attention of another person and receive doctor help,” said the doctor. Once a flight attendant is aware of the situation, he or she will usually make an announcement over the intercom system asking for the help of a physician. This is both for airplane safety and for the safety of the passengers. How can a doctor help? Joel Schlessinger shares experiences. “There are many different skill sets in physicians,” said the doctor, “and some tend to shy away from acute care/management due to their personalities. Joel Schlessinger MD said one of the most concerning times was when a passenger lost consciousness right before landing. It was unclear if the passenger was having a stroke or not. After the passenger was sent to the hospital, it was discovered that the passenger had a seizure condition and had not been taking medication. Have you ever been called upon to help a passenger? Tell us about your experience in the comments. Dr. Joel Schlessinger: a spotlight on the Joel Schlessinger media blog. One of my favorite things to do is to talk with media so that large numbers of people can receive quality information about skin care. To help spread the word even further, I’ve created a Dr. Joel Schlessinger media blog.